eko where asked to by Continuum to help produce around 40 mini videos that where to be used on a kiosk at The Bowes Museum. 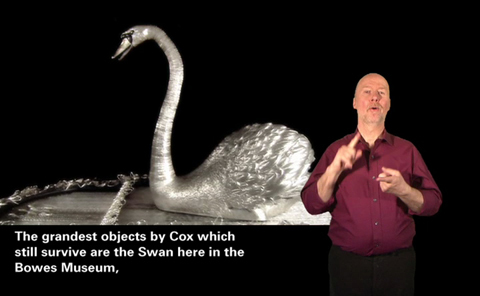 The videos explained the story behind the Silver Swan which dates from 1773. The kiosk is placed next to the swan to explain the story. eko where handed footage that had been already shot and edited it into mini 1-2 minute clips. We then filmed a British Sign Language expert on greenscreen. Then overlayed the sign footage over the edits. We also included subtitles. The videos have now been installed at The Bowes Museum.